Tsavo Lion wrote: So, it's possible to stretch the IL-76MD-90A by at least 6.6m to equal the IL-76MF in length, thus increasing its max. payload even more. But, there's a trick to beat the MTOW limit: takeoff with less fuel, more cargo & top off in the air! See my prev. post on its cancellation. However, in order to compare different planes and their performance you have to fix one or more of these conditions. "The mixed aviation regiment of the Military Transport Aviation (BTA) will be formed in Ulyanovsk before the end of the year, told BTA commander Lieutenant-General Vladimir Benediktov. "Until the end of this year here, on Ulyanovsk land, we plan to complete the formation of a military transport aviation regiment," he said. The air regiment will be equipped with An-2 and Il-76 aircraft, including a new version of Il-76MD-90A, built at the Aviastar plant in Ulyanovsk. "In the long term, the An-124 will also be in the regiment," Benediktov added. " How many An-124 will be in service after all aircraft in storage are upgraded? the C929 could serve as a fuel efficient platform for large Chinese or Russian ..like airborne early warning command and control, aerial tankers, surveillance, electronic intelligence gathering, and VIP transport. A C929 in PLAAF service could serve as a refueling tanker (the similarly sized A330 MRTT is already in Australian, British, Saudi and Singaporean service) for Chinese bombers and stealth fighters. The C929 would also be more fuel efficient than Y-20 and Il-76 cargo planes, making it a longer ranged aerial command center for Chinese air operations, as well as serving as an "Air Force One" for Chinese leaders, in addition to being an airborne nuclear command post. Russia could also use it for those roles. PapaDragon wrote: How many An-124 will be in service after all aircraft in storage are upgraded? An-124 upgrade was another victim of the parts embargo from Ukraine. Have not read where they have started manufacturing substitutions. Yeah, no Russian engine till 2030 just killed it as a military option... don't you read the news? The Il-96 is a good platform for inflight refuelling because its capacity to hold fuel is better than the Il-78. If the new model Il478 can carry 62 tons of fuel then the difference is blurred, but I doubt it could match the flight range of the Il-96 too. There is nothing wrong with the Il-78, it is just that a bigger aircraft would be more efficient at the role which will remain primarily to refuel strategic bombers on their way to the US. A strategic bomber takes a lot of fuel... an Il-78 can support 10 tactical aircraft by giving them 4 tons of fuel each at 2,500km away from the Il-78s base of operations. Bigger aircraft carrying more fuel to off load means it can support more aircraft. The An-124 is a good aircraft, but they need something to replace it as soon as possible... the most urgent thing is new engines that are not Ukrainian. They are working on this and hopefully they will come up with an elegant solution like several of the designs they have shown publicly that include twin, four, and six engine models of one scaled design to replace the An-22, An-124, and An-225. Having their own design with their own engines they can export without worrying about foreign parts or licence production etc etc would be ideal. That would mean a large family of three aircraft and a smaller related family with the Il-476 and Il-276 with four and two engines in the 62 ton and 30 odd ton payload class. The smaller aircraft using the PD-14 and the larger aircraft using the PD-32 being developed for the PAK DA from the NK-32 engines of the Tu-160. If Russia would be in need of new military transport aircrafts, which would be the signs? 1.- Few aircrafts with many work loads, leasds to an early exhaustion of the aircrafts. 2.- Early exhausted units would be canibalized to keep other aircrafts active longer. 3.- Early exhausted and canibalized units would be decommissioned. Do you see this? No. In fact we see a good number of aged aircrafts far from exhaustion in the Russian Armed Forces, which means they have been far from saturation. Right now it is not using transport aircraft very much... if the VDV were more active or they had a war to support then their existing fleet of aircraft would be more tested. Their problem comes in 2024 when the An-12s get worn out, and their An-22s are all gone and their An-124s are needing upgrades and improvements and their engines need replacement. With so many aircraft relying on Ukrainian parts or Ukrainian support they will be having serious problems in a few years time if they do nothing now. Moving to an all Russian transport fleet will improve things dramatically and remove final issues that will effect the Russian military. No they are not desperately short of available transports now but by that stage it will be too late. Ideally the VDV should have its own fleet of transports... they are the elite and need to have their own transports... you can't have a fire department that needs to phone a fire engine hire service to borrow fire engines when a house catches fire... you can't risk that someone already has not hired a fire engine for a party and the result is a burned down house. To be truly independent and capable they need their own fleet of planes ready to move when they are. The exhaustion of aircrafts is an accumulative process. There is a moment where the limits are reached (the standard limits allowed by the Russian Armed Froces), and the aircrafts are retired, canibalized and decomissioned. The question is that if there is a good amount, even big amount of aircrafts that are reaching over 50 years old without reaching mechanical exhaustion is because they had an entire life working with low level of loads and keep still a mechanical reserve to be used despite the age. Russia has been working in agreement with this situation, it explains how many aircrafts have been in the reserve despite to be young, and returned later again to the active service after older aircrafts have been decommissioned. They worked effectively by this way in order to reach the total exhaustion of the models of aircrafts and helicopters which production finnished before 1985, including the An-22 and the Mi-6/10. that are almost totally retired. The alone exception is the An-10/12 that they wanted to keep longer. Neither the total exhaustion of the An-22 (today only 4 in active service and 5 in the reserve which canibalization is being done) or the Mi-6/10 (today 0 in active service and 19 in the reserve which canibalization has been done in favor of the units to remain as monuments) means a problem for the Russian Armed Forces, because the Russian Armed Forces have a reserve of aircrafts and helicopters of close size cathegories, more than enough to absorb the loads moved today by the last units of these models working. And the total exhaustion of both will be very likely finnished under the 2018-2025 State Armament Program. Both will have a replacement because are in some of the most useful effective and profitable size cathegories of transport aircrafts and helicopters looking at the future, but the succession is not something forced because of lack of alternative to move the loads of the An-22 and the Mi-6/10. Russia obviously has been keeping units of the An-10/12 and the Il-18/20/22 with low use in order to use other aircrafts. And this has been possible only thanks to have a fleet bigger than the real needs all these years. With this situation of delay in the exhaustion of units of the An-10/12 and the Il-18/20/22 because of low use, it is obvious that Russia is not in a hurry to build new transport aircrafts at this point and for some years, because the same effect is also observed for other younger models of aircrafts and helicopters. As consequence we will see low production under the 2018-2025 State Armament Program. The work in this timeline will be focused in the development of transport aircrafts and helicopters for the current new generation. But even in these two cases, it is possible to see in the structure of active/reserve aircrafts (specially evident in the case of the Il-18/20/22), how Russia has been working and is working right on it. Now after the exhaustion of older models of small airliners, the use of the Il-18/20/22 is intense, with almost all the remaining units in active service, while the use of the Tu-134 remains lower, waiting still. Even more significative is the delay in the exhaustion of the An-2. At the current rythm a good number of aircrafts will reach 60 years old remaining in active service. Surely here Russia needs to do a planning for a faster total exhaustion of this aircraft, likely directing loads from helicopters to this aircraft. The presence of the An-2 still makes the Russian military air fleet to look older and less advanced than it is in reality. Almost all the remaining An-2 are from the 1958-1970 period with only 1 older and 6 younger. With this prospect, to think about military orders of some aircraft of the same type is fairly out of touch. Not even of the L-410 (the company that have been producing them declared bankruptcy after to try to move the production to Russia). GarryB wrote: Ideally the VDV should have its own fleet of transports... they are the elite and need to have their own transports... you can't have a fire department that needs to phone a fire engine hire service to borrow fire engines when a house catches fire... you can't risk that someone already has not hired a fire engine for a party and the result is a burned down house. I do not agree, they do not need to be independent, they need to do they job right. They are experts on their own warfare and fighting tactics. That is all. Transport aircrafts need air escorts, need pilots well trained,... I expect you be not thinking about a fleet of own fighters or their own pilot training school for the VDV. In fact independence is not a good thing for a military branch. Im not between the people that thinks that small airliner and transport aircrafts have a good prospect in the future. I do not advise to bet on them in overall terms. Now there is a project, the Il-112, that is being justified as replacement of the An-24/26/30/32, more concretely the transport variants. Before to bet on this aircraft I would recommend to look at the exhaustion model followed by the An-24 and its impact in the orders by the ministery of defense of the Il-114. The number of aircrafts listed as present in the reserve would be bigger still, with 29 in the Russian Aerospace Force and 3 in the Russian Naval Aviation. Surely it would be possible to make to fly to some unit else, but it seems that these aircrafts will be canibalized by the transport variants of the An-24/26/30/32. Today a majority of the An-24 are listed as monuments and as decommissioned (by different reasons), 40 in the Russian Aerospace Force and 2 in the Russian Naval Aviation. The main reason for the lack of orders and procurement of airliner aircrafts of this size has been the disadvantage in costs per person and Km, and the presence of big number of more profitable airliner aircrafts of bigger size, like the Il-18/20/22 or the Tu-134. Looking at the transport variants of the An-24/26/30/32, the things can go by the same way. I do not advise to bet on the Il-112. The main problem is in the structural disadvantage of small aircrafts on costs per Kg and Km. They rely on DA (Transport aviation) to have enough aircraft available for them to do their job.... the DA don't always keep enough aircraft available. Cancelling an exercise is a problem, but for operations not having aircraft would be critical. Like I said.... there is no point in having a fire department that does not have its own fire engines and just hires them when it needs them. There is not reason to think that the Airborne Troops would manage better the transport aircrafts. In fact transport aircrafts are not the speciality of the VDV, while they are the speciality of the BTA. As consequence it is right to think that the BTA can manage better the air transport fleet than the VDV. Like a fire departament owns not the roads used to reach the fire and care not about their construction or maintenance, the VDV owns not the transport aircrafts to reach the location of their missions, and neither owns the roads when they move on land instead than on air. Transport aircrafts are for the VDV like air roads where they travel to reach the location of their mission. The BTA can't make aircraft appear from thin air. I have read an article where a high up official in the VDV complained that exercises didn't take place in the 1990s because fuel was no available and aircraft were not available. Imagine if they needed them in an emergency... there was little to no warning regarding the Georgian invasion of South Ossetia, so zero chance the VDV could intervene immediately from the air... there was simply no available air transport. It is not about managing aircraft, it is allocating resources that are needed to the forces that need them. The solution was supposed to be the An-70 but we both know that solution will never come. If the VDV still have to rely on transport aviation how can they be sure what they need will be ready when they need it? This is actually correct if an airborne force does not have the ability to get planes when they need them, then that force is doomed to fail. VDV should own their own transports to ensure they can do their job when needed and not hope they can do it. I always wondered why they do not and really it makes no sense that they don't. It is reported that on December 1, 2017, a ceremony was held in Ulyanovsk at the Ulyanovsk-Vostochny airfield (Aviastar-SP factory airfield) to mark the completion of the formation of the 235th Military Transport Aviation Regiment of the Military Transport Aviation of the Russian Air Force. The regiment became part of the simultaneously formed 18th military transport aviation division with control in Orenburg. The newly-formed 235th military transport aviation regiment is planned to be equipped with new Il-76MD-90A military transport aircraft, the issue of which was organized at Aviastar-SP in Ulyanovsk. As the basis of the material part during the formation, the 235th regiment received ten Il-76MD aircraft from the 117th military transport regiment from Orenburg, nine of these planes arrived in Ulyanovsk-Vostochny on December 1. Colonel Vadim Dyrdin was appointed commander of the 235th regiment. In addition, it is reported that the 235th regiment will use several AN-124 Ruslan heavy military transport aircraft - as one can understand, from the number of VCS cars being restored by Aviastar-SP. On December 1, the ceremony of rolling-out after the completion of the capital repair and modernization of the An-124-100 military transport aircraft of Russia (registration number RA-82011, serial number 9773054616023, serial number 01-10) was held at Aviastar-SP. At the same time the plane was given its own name "Oleg Antonov" in honor of its designer. The aircraft should be handed over to the 235th regiment, in which it was operated from 1989 to 1998 (in 1998 the aircraft was returned to the 566th Red Banner Military Transport Aviation Regiment, since 2003 it was stored at the Sescha airfield, from end of 2015 was capital repair reconstruction at Aviastar-SP). On the bmpd side, we recall that the 235th Military Transport Aviation Regiment was originally formed in October 1989 at Sescha airfield (Bryansk Region) as the second regiment of the USSR Air Force equipped with the new An-124 heavy military transport aircraft (after 566 the Red Banner Military Transport Aviation Regiment in the same area, equipped with An-124 aircraft since 1987). In connection with the cessation of the production of An-124 aircraft for the Air Force after the collapse of the USSR, the 235th Regiment was not fully staffed by them. 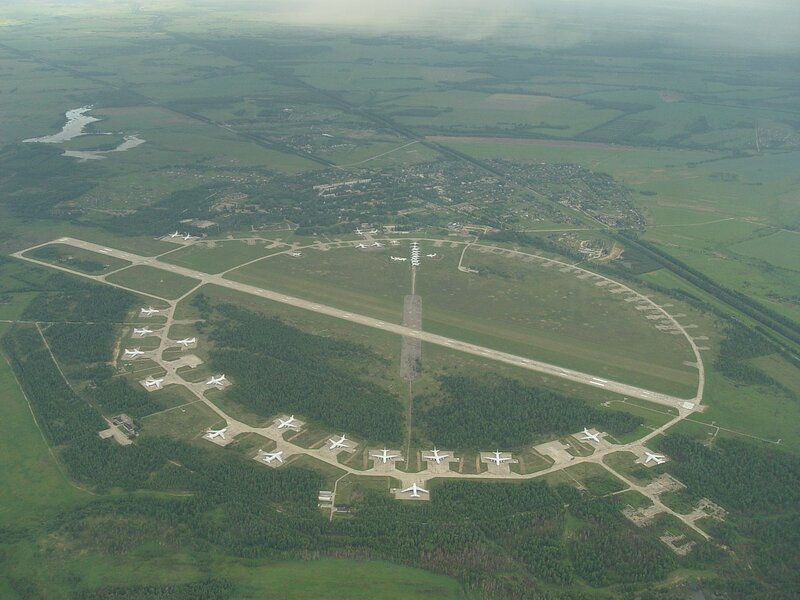 In early 1995, the 235th Regiment was redeployed from Seschi to the Ulyanovsk-Vostochny airfield, but in 1998 it was disbanded, with the transfer of the An-124 aircraft from its structure back to the 566th Regiment in Sescha. According to available information, currently VC Russia has 26 An-124 aircraft, of which ten are in a flying condition (the RA-82011 will be the eleventh airplane). That's pretty low, 11 Condors for a country with size of Russia. The upgraded An-124 was given the honorable name "Oleg Antonov"
On the same day, the first 9 Il-76 aircraft arrived in Vostochny with the aim of forming here a military transport aviation regiment. The new 235th Air Regiment, which is part of the 18th military transport aviation division, will be deployed in Ulyanovsk. Orenburg has formed a military transport aviation division. The aviation fleet includes transport aircraft Il-76, A-12,An-26, An-72 and other aviation equipment. 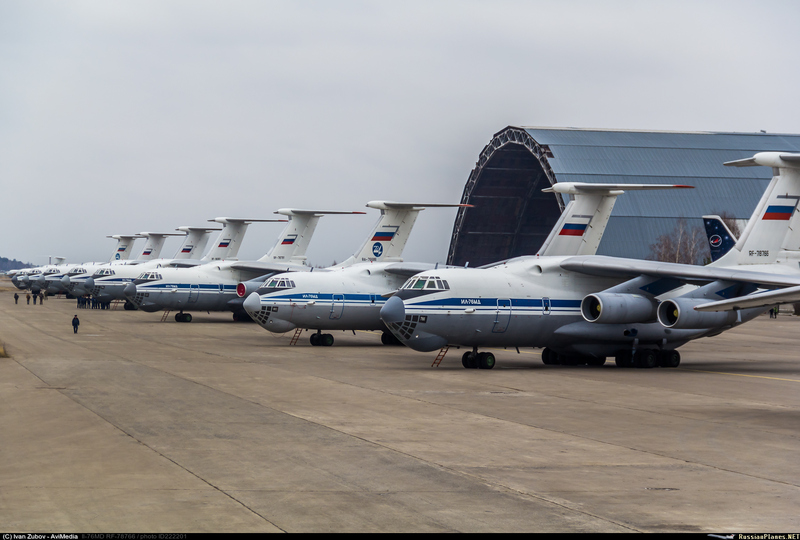 The former structure of 4 regiments (Tver,Pskov,Taganrog,Orenburg) with 3 sq, of 9 Il-76 , totaling 108 Il-76 is changing to 6 regiments of 2sq. The 224 LO with 16 Il-76 (4 in each base) seems have been disbanded.Two of this planes have arrived to Ulyanovsk. The An-124 , probably will be attached to the divisions in Ulyanovsk and Tver (replacng An-22 in 76 OVTAE) . and 566º disbanded or moved to other place. An-124 seldom flies. They aren't used even to transport equipment to Syria, preferring the cheaper option of using ships. For transportation inside Russia, or even for exercises with China, the well-developed railway system is the most used.